Yesterday the temperature was 97° up here and it has been hotter than all get out for the past week. This heat wave will continue through this first week in August. Standing at the stove cooking hot heavy food is just not an option. Right now we are craving cool, crisp, crunchy salads that take minutes to prepare but are full of mouth watering flavors. I have been making Pesto with Basil from our garden so I knew I had a starting point for this salad I tossed together this morning. 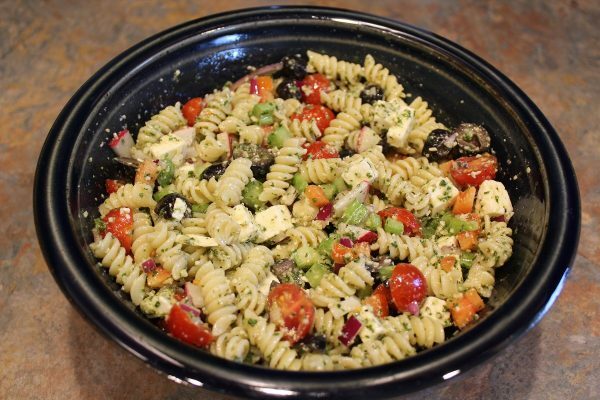 But, store bought Pesto is just fine and certainly makes this dish even easier to prepare. The intense flavors from the Basil and Parmesan will make your taste buds sing! 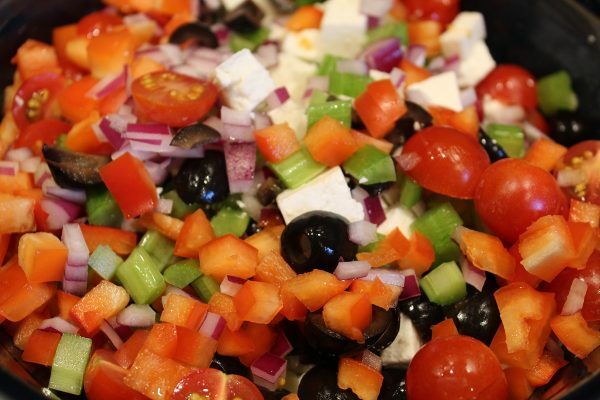 Combined with some scrumptious fresh veggies, this salad is truly a winner. The bright colors of all the vegetables are so inviting. Just makes you want to grab a fork and dig in! Because it literally takes just minutes to prepare you’ll have a lot more time for sitting under that shade tree with a large glass of Iced Tea. Sparky gave this 2 thumbs up! Ready? 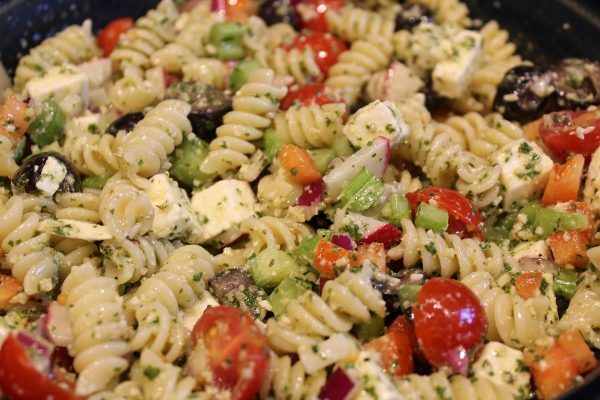 Let’s build us a Heat Wave Pesto Pasta Salad! 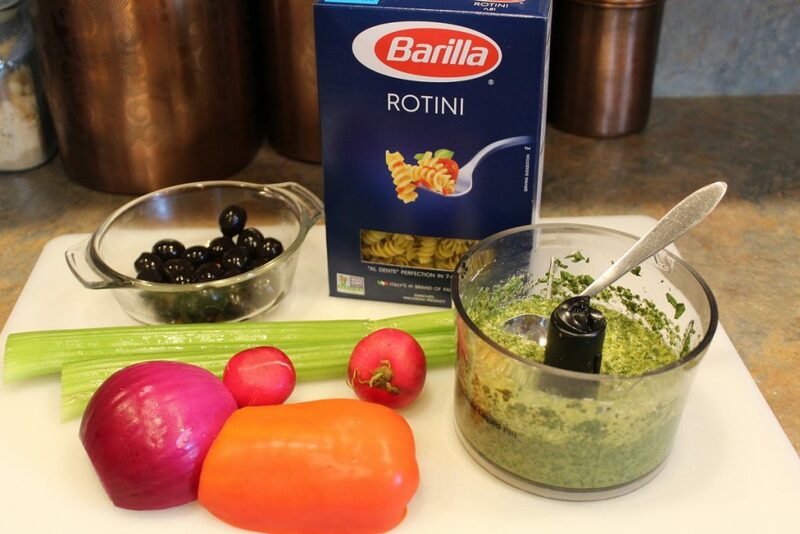 Packed with flavor from both the Pesto and all the fresh vegetables this is one wonderful summer salad! 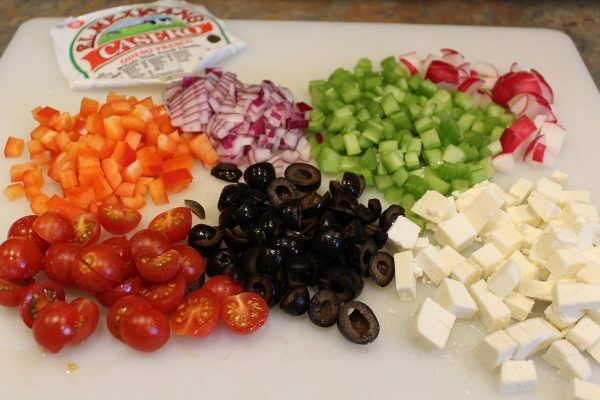 Chop all the veggies while the Pasta is cooking, then just toss it all together. Easy as pie! I used whatever vegetables I had in the fridge but you can certainly vary the recipe with what you have on hand. Green Peas, chopped Artichoke Hearts or a can of Chick Peas would be wonderful additions. I like the Queso Fresco for its texture and mild flavor but Provolone, Gouda or Swiss would also work well. Cook and drain the Pasta as per package instructions, about 7 minutes. 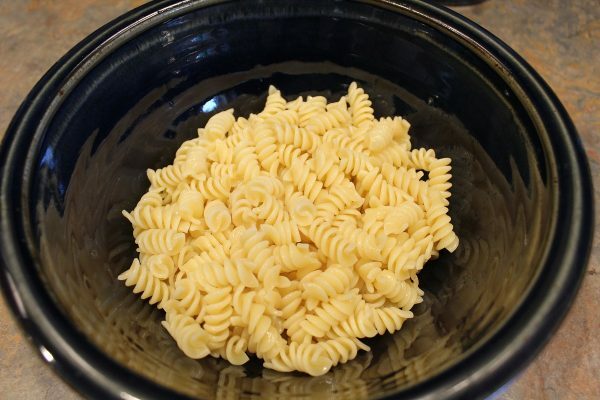 Place into a large bowl. Chop, slice and dice all the vegetables. Crumble the Queso Fresco. Add the vegetables and cheese to the cooked Pasta. Stir in the Pesto and the EVOO until evenly coated. Taste and adjust with Salt and Pepper. Truly no more than 15 minutes to put this all together. OK....now for that Iced Tea. Thanks for stopping by today friends. I truly enjoy sharing my life and recipes with you all from Back of the Beyond in Ferry County, Washington. Wishing you all hot Summer days and cool Summer nights. Enjoy it all!